Brisbane, Qld, Australia – 2016 – Electrical switchgear engineers NOJA Power today announce the comprehensive suite for remote network performance index reporting for the RC10 Recloser Controller system. In an evolution from basic SCADA reporting, the latest iteration of RC10 firmware allows end users to establish far greater insight on network parameters, providing efficient, customized and specialised data for network optimisation. 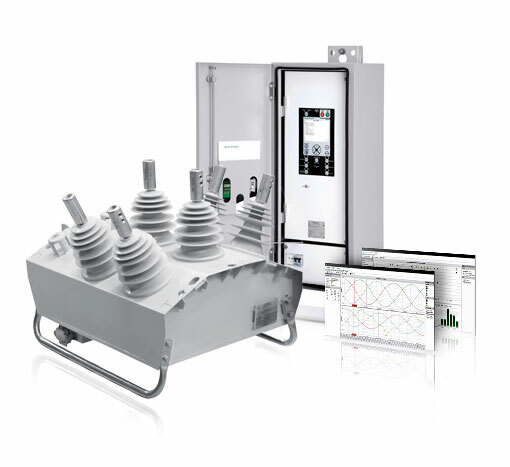 The NOJA Power OSM Automatic Circuit Recloser (ACR) system is a fully integrated recloser switchgear and control package which employs class leading sensors capable of delivering high resolution measurements. Through implementation of optional remote engineering access through NOJA Power's Power Quality Software (PQS) suite of functionality the RC10 now provides accessibility network performance metrics for access via remote interrogation. In a global climate where the pervading mantra of network utilisation is the optimised use of network assets it stands to reason why a utility would appreciate the additional information made available by advanced Recloser Controllers such as the NOJA Power RC10 throughout their network. Given that NOJA Power OSM Reclosers are typically installed across all critical connection points within a distribution network, the information that can be made available from these controllers is invaluable in the network operation decision making process. There are a plethora of indications available from this controller such as harmonic content, system interruption metrics* reporting, remote oscillography capture and even settings management with custom reporting design. Replacement of aging network assets with advanced recloser systems such as the NOJA Power OSM® series provide a broad spectrum of rewards which are not always immediately apparent. Network harmonics issues in the past were typically diagnosed after a catastrophic failure. Usually this level of failure was demonstrated by a catastrophic (read as fire/explosion) of oil filled transformers pushed beyond their limits by unmonitored harmonic content from polluting customers. Post-mortem examinations on destroyed switchgear is hardly the ideal method for discovering a harmonics issue, which is why remote reporting of harmonics is a useful feature. Today, utilities can use their NOJA Power RC10 controllers to report harmonic content. With this switchgear infrastructure distributed at critical connection points particularly at major industrial sites, utilities can opt to alarm or even trip off customers guilty of causing damage to utility networks. The NOJA Power OSM Recloser allows utilities to be proactive by actively retrieving accurate network data from their intelligent switchgear assets. Further analysis is of far greater benefit for utilities also in the aftermath of a fault event or reported harmonics issue. Traditional SCADA points only offer binaries and analogue points indicating which protection element tripped and what the maximum fault current is. What is greatly useful in the analysis process is to access a capture of the current and voltage waveforms of the time period around the disturbance occurrence. The NOJA Power RC10 presents an opportunity for utility customers to access fault record data at their key protection sites. This oscillography data captured and stored within the RC10 recloser controller can be accessed remotely by utility engineers using a secure network. In the past, accessing information such as this involved the dispatch of a technician team to the field for retrieval of fault data and preliminary fault analysis. Through the new remote data access capability of the NOJA Power RC10, utility engineers can securely and rapidly access data following a fault for comprehensive fault analysis. Finally, the same mechanism for remote oscillography retrieval can be utilised for remote engineering access to network controllers. Aside from providing benefits associated with detailed performance index retrieval, utilities are granted the option of implementing a remote settings management scheme. For rural utilities facing the challenge of a large geographic area, operating costs can be exorbitant for modification and management of feeder settings. A single change to a protection curve in a controller 8 hours’ drive away could result in utilities paying the accommodation and meal bills of their technicians who are forced to stay overnight at remote locations purely to service their asset base. The cost savings associated with secure immediate access to intelligent distribution network system assets far outweighs the challenges associated with the implementation of a secure network for remote settings operation. Since the very first implementation of electronic controlled network switchgear, utilities have embraced the benefits of remote SCADA for control and reliability improvement within their network. This culture of embracing the capacity of remote management and monitoring of distribution network system assets continues to drive innovation within the distribution network asset space. NOJA Power’s new suite of remote engineering access and network performance index reporting within the NOJA Power RC10 controller provides utilities with extensive vision and control over their network. With the unrivalled analysis power and control provided by the RC10 controller, utility engineers can be proactive in outage aversion, rather than conducting post-mortem analysis on expensive network asset failures. Comprehensive real time harmonics and interruptions information is now readily available to these engineers to ensure that power quality issues do not lead to costly outages. Additionally, this capability removes the need for utility engineers to request expensive work days from technicians to travel to site to retrieve and modify settings in the field – the control and access is provided directly to the engineers with the greatest understanding of the network design. Through this evolution of remote settings management and reporting, the NOJA Power RC10 demonstrates why it is clearly the most advanced recloser controller available today.